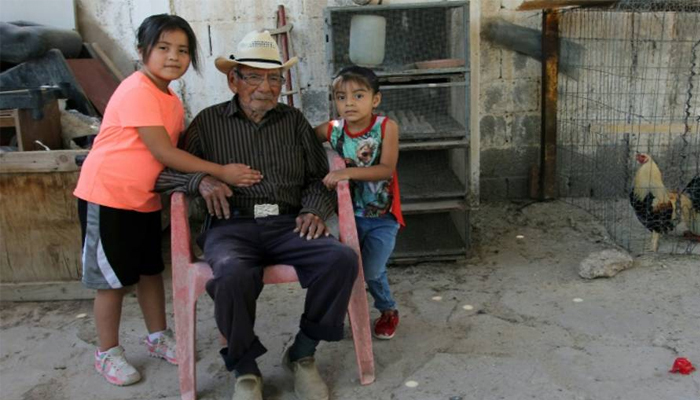 Ciudad JuÃ¡rez, Mexico: You wouldn´t know it watching him take care of his chickens on the family farm, but according to his birth certificate and official Mexican ID, Manuel Garcia Hernandez is 121 years old. Garcia, who may just be the world´s oldest man, was born on 24 December 1896, according to his birth certificate from the Mexican state of Veracruz and his official identity card from the National Electoral Institute. Anyway, age is only a number. Garcia says he doesn´t feel a day over 80. "I´m happy, but I do feel tired. I´m making an effort, because if I just lay in bed or sat in a chair all day, then I would get sick," said Garcia, dressed in his trademark cowboy hat and Western shirt. "I feel like I´m 80 years old -- though I´m starting to stumble a bit when I walk," he told AFP. Garcia has seen a dizzying amount in his lifetime, from the arrival of electricity to the invention of television, the Mexican Revolution and the election of US President Donald Trump -- his 22nd American president. Tomasa´s daughter and her family live next door, and another neighbor, an American, lets Garcia raise chickens in his large patio. "I´d like to be able to work the way I used to, make my living in the fields. But I can´t anymore. That makes me sad. I was very hard-working as a young man," he said. So, is Garcia the world´s oldest man? Garcia´s skin is wrinkled with age, and he lost a finger at 80 years old when it got tangled in his twirling lasso -- an ancient cowboy´s war wound. "I ask God to give him some more years, until he has had enough," said his daughter Tomasa. "Sometimes he tells me his candle is going to go out little by little, but I don´t think so. He´s alive, and I´m happy for that."